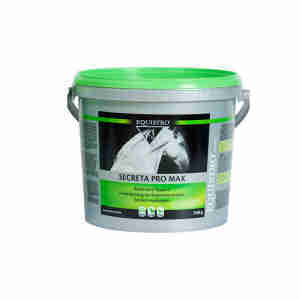 Equistro Secreta Pro Max is a complimentary feeding stuff for horses. It is recommended for horses to maintain normal respiratory function and environment. It is rich in selected plant extracts in combination with vitamin E that are highly refined to ensure premium quality. Coltsfoot, , Grindelia, Mullein and Climbing Ivy help maintain secretion production that is of optimal viscosity. Thyme, Liquorice, Burdock, Grindelia and Mullein are also reputed for their support of the respiratory hygiene status. Vitamin E, which with grape seed extract (polyphenols), has a synergistic antioxidant role and contributes to normal defence mechanisms. In conjunction with good management, dietary fortification may support the respiratory and immune mechanisms necessary for a good health. SECRETA PRO-MAX is an association of carefully selected and refined plant extracts, enriched with Vitamin E, targeting the healthy performance of the respiratory system.